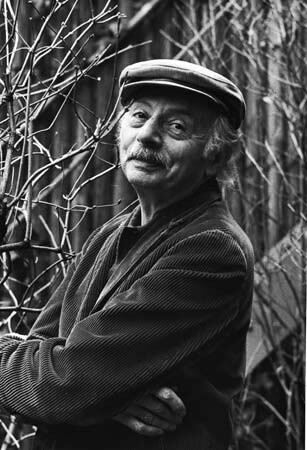 Stanley Kunitz (1905–2006), co-founder of Poets House, once said that when he failed to find a community of poets he felt compelled to make one. He was instrumental in the founding of the Provincetown Fine Arts Workshop as well as Poets House. 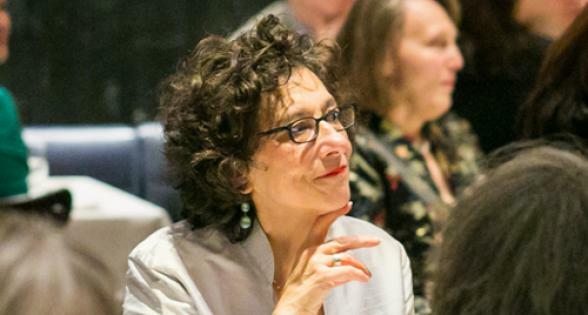 And he was a devoted mentor and teacher to many, including Marie Howe, Carolyn Forché, and Louise Glück. His passion regarding the importance of teaching poetry extended past the nurturing of the next great poet, however, to the nurturing of poetry itself, which he felt was essential to the well-being of a just society. 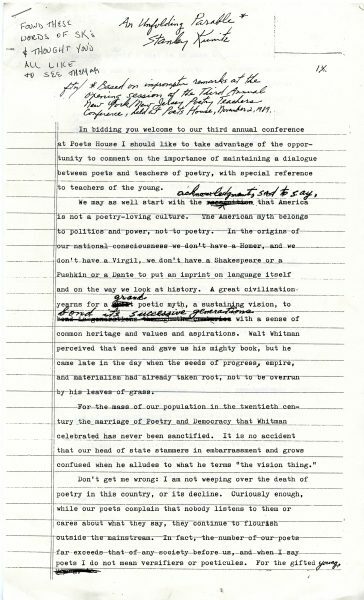 Mary Oliver described the poetry of Stanley as bearing “the intellectual courage that insists on the truth, which is never simple.” This intellectual courage is in full display in “An Unfolding Parable,” Kunitz’s address at the Third Annual New York/New Jersey Poetry Teachers Conference, held at Poets House on November 2, 1989. His words, though they reference then-President George H.W. Bush, point to a “problematic new order of the universe” that is strikingly familiar to our current moment of crisis. In bidding you welcome to our third annual conference at Poets House I should like to take advantage of the opportunity to comment on the importance of maintaining a dialogue between poets and teachers of poetry, with special reference to teachers of the young. We may as well start with the acknowledgment, sad to say, that America is not a poetry-loving culture. The American myth belongs to politics and power, not to poetry. In the origins of our national consciousness we don’t have a Homer, and we don’t have a Virgil, we don’t have a Shakespeare or a Pushkin or a Dante to put an imprint on language itself and on the way we look at history. A great civilization yearns for a grand poetic myth, a sustaining vision, to bond its successive generations with a sense of common heritage and values and aspirations. Walt Whitman perceived that need and gave us his mighty book, but he came late in the day when the seeds of progress, empire, and materialism had already taken root, not to be overrun by his leaves of grass. For the mass of our population in the twentieth century the marriage of Poetry and Democracy that Whitman celebrated has never been sanctified. It is no accident that our head of state stammers in embarrassment and grows confused when he alludes to what he terms “the vision thing” [George H. W. Bush]. Don’t get me wrong; I am not weeping over the death of poetry in this country, or its decline. Curiously enough, while our poets complain that nobody listens to them or cares about what they say, they continue to flourish outside the mainstream. In fact, the number of our poets far exceeds that of any society before us, and when I say poets I do not mean versifiers or poeticules. For the gifted young, to declare oneself a poet is to make a political statement of sorts and to enter the ranks of a precarious and challenging subculture. Poets are born survivors; I worry less about them than I do about our nation’s destiny, about what is happening to the quality of American life and spirit. We cannot foresee the future, but we can predict it will be difficult and dangerous. I am not at all confident that today’s superpowers are preparing for the right century. How well the U.S.A. will fare in the problematic new order of the universe will depend to a large extent on how adequately we equip our children with the intellectual, moral, and spiritual disciplines that could make them whole. Any course of instruction that separates knowledge from feeling or reason from imagination, serves only to exacerbate the most egregious ills of the modern psyche. Poetry is intimately concerned with the historic process. It tells us what it feels like to be alive in a given time and place. Words themselves, forever tuned to the passing show, forever tied to their own roots and yet forever changing, are the most sensitive recording instruments. The history of poetry can be read as an unfolding parable. Why were most Americans so astonished to learn, in the aftermath of recent upheavals in eastern Europe, that poets in the end are stronger than tyrants? We could scarcely believe our ears when we heard that people like us, in the exercise of their free will, had actually chosen poets and playwrights to lead them toward the uncertain, but beckoning, future. My perception is that while we were swept into the tide of their exhilaration, rejoicing with them, we envied them a little for their privilege of honoring those who had resisted oppression with the only weapons at their command, their courage and their craft; who had refused to break under the iron heel; who had kept alive the image of a free and just society through the dreadful years. This is what poetry can do, and is ready to do again anywhere on earth, in fulfillment of its commitment and its destiny. In a time of crisis it is always morning for the myth-makers.